Chipla Kedar Trek (Haldwani - Almora - Bering - Didihat - Dharchula - Brahmkund - Chiplakote - Narayan Ashram - Dharchula - Pithoragarh - Bhimtal - Haldwani). About Chipla Kedar Lake:- This trek offers picturesque view of Himalayas, the main attractin is Chiplakund (Chipla lake) at an altitude of 16,000 ft. As per hindu mythology, it was knwon as 'Gupt Kailash' (hidden kailash) in past. Every two years people from 42 villages gather here to worship, and this continues for 5 days. The Best season to visit is March-July and September-November 15. Arrive at Haldwani / Kathgodam by overnight train / bus. We pick you from Railway Station or Roadways Bus Station. Assembling at Kathgodam Railway Station. At 9 AM we proceed toAfter breakfast we drive to Dharchula. Enroute visit Swami Narayan Ashram at Narayan Nagar (The Ashram was establishd by a hermit and a social worker Narayan Swami ji. The ashram survives through donations from various institutions and individuals). Overnight stay in Hotel at Dharchula, here the tourists are briefed about the Chiplakedar trek. Early morning medical checkup of all the tourists. After breakfast we drive to Tawaghat (19 km. ), a warm traditional welcome to start the trek. We trek 5 km. to Bunga (our camping ground) enroute village Khela. Camp here overnight. In evening we organize local folk dance (Chanchari dance) by localaites followed by a local tribal delicacies dinner. After breakfast to trek 10 km. to Pinkhu (Tilargarhi) at an altitude of 12,000 ft. Overnight stay in camp, evening bonfire. After breakfast trek 8 km. to Talagarh at an altitude of 14,000 ft. Enroute visit Brahmkund (12,500 ft. known as residence of Lord Brahma, the State Flower of Uttarakhand 'BrahmaKamal' is found here). Overnight stay in camp at Talagarh. After breakfast trek 10 km. 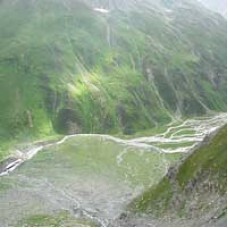 to Pataudkund. at an altitude of 16,000 ft. Enroute we explore Sindwari (15,500 ft.), ChiplaKund (14,500 ft. known for rich herbs), Kakraulkund (15,000 ft. the land of Harchan and Sirchan Dev), Jauly (15,500 ft. known for sitting of all lords). Pataudkund is a lake, and known as residence of lord Patau Devta. Overnight stay in camp. After breakfast we trek 12 km. to Girchi. Overnight stay in camp. After breakfast we trek 10 km. to Duku. Enroute explore Tilandili (known for paying homage to ancestors). The trek gives you an opportunity to explore the dense forests (Himalayan wild animals are found here). Camp overnight at Duku. After breakfast drive to Haldwani Via Pithoragarh. Pithoragarh is known a miniature Kashmir, its a beautiful Valley, and District headquarter. Enroute Haldwani, we visit Bhimtal (A famous lake). Tour concludes on reaching Haldwani. 1. Haldwani - Dharchula - Haldwani transportation by shared Jeep. 2. All meals (vegetarian only, breakfast, lunch, and dinner). 3. All Trekking and Camping Equipments (Rucksack is not included, to be bring by the tourists). 4. All Porter Services for Camping Equipments (Personal bagage is to be carry by tourist on his / her own). 1. Any items / services of personal consumtion (e.g. Mineral Water, Medicines, Phone calls, snacks not included in our meal plan etc.). 2. Any service not mentioned in the 'The Packages Includes' section above. 3. Porter Service can be hired at extra cost to carry personal baggage. 1. People suffering from high altitude sickness are advised not to participate. People suffering from High Blood Pressure are also advised not to trek. 2. Tourists suffering from common deseases are advised to carry their medicines with them. 3. Carry One ruckscak only, with your clothings for high altitude. Carry Raincoat, Torch, Umbrella, Gloves. 4. Respect culture of local people. 5. Carry all valid documents with you (Identity Card, Medicines Chart etc.). 6. Be friendly with other group members. Please read our Disclaimer before sending booking requests.